Jaggers “found” proof that the scratches on Molly’s hands were from a thicket of brambles (not from the murdered woman’s fingernails due to a struggle). Bits of Molly’s dress were found on the brambles and bits of brambles were found in Molly’s scratches. This was Jaggers’ first real big case. The opposition claimed that Molly had a three year old daughter by the murdered woman’s husband. But the child was no longer around and they claimed that Molly killed her to revenge the man. Jaggers was able to argue against this… it wasn’t a murder case for the child. In the end, Jaggers and Molly won. She was acquitted. But she’d lost her daughter and was under the employment of and debt to Jaggers for the rest of her life. After Pip learned this story, the story of Molly, from Wemmick, Wemmick tells him that he got Pip’s letter about seeing Wopsle at the theatre and about being followed by Compeyson. The next morning (Chapter 49) Pip goes to visit Miss Havisham at her request. I bought some ArtGraf water soluble graphite sticks. These are really cool! You can draw with them, shading and lines. Adding water with a brush turns them into graphite washes. 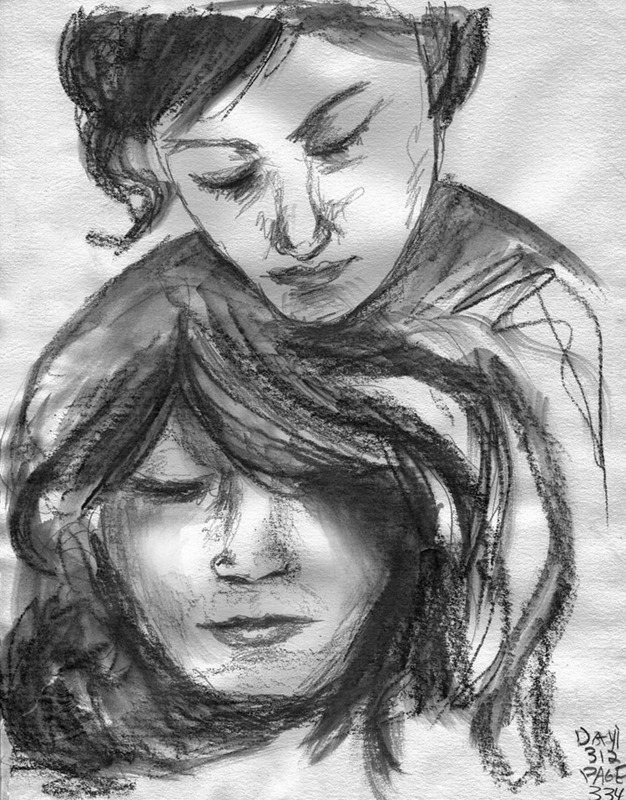 Decided to give them a try and do this sketch of two women. I am assuming that Molly hasn’t seen her daughter, Estella since she was a young child. This was when Molly was tried for murder, then went to work for Jaggers, giving Estella up to be raised by Miss Havisham. I did two sketches. This is the first on very thin sketchbook paper (mistake). The paper warped and even tore in one place. That’s OK though. I still like how it turned out.